Mamata Rout of Sidhamala, Nayagarh District, Odisha, had delivered two premature baby girls in the 30th week of pregnancy. 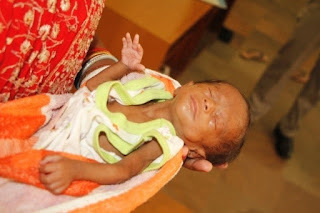 They weighed 900 gm and 1500 gm respectively, and were kept at the NICU of the local government hospital for 25 days as the parents couldn't afford to take them to Bubaneswar for better treatment. Dr Sweta Mohapatra, an Ophthalmologist at Nayagarh, trained at LVPEI in early diagnosis of Retinopathy of Prematurity (ROP), a condition affecting the eye health of premature babies, diagnosed the twin babies with ROP. The RBSK (Rashtriya Bal Swasthya Karyakram, a state Child Health Program for the disadvantaged) helped rush the babies to LVPEI Bhubaneswar. RBSK’s pediatrician Dr Lingaraj Pradhan admitted one of the twins who needed urgent treatment to the Special Newborn Care Unit (SNCU) at Capital Hospital Bhubaneswar where her health was stabilized. At the brink of losing her vision, the baby underwent advanced ROP treatment, including injections and laser sessions, under the skilful hands of Dr Tapas Ranjan Padhi of LVPEI Bhubaneswar. Thanks to the collective efforts of the various teams, the baby today has healthy vision and will no longer be blinded for life. BHUBANESWAR LVPEI team did excellent job to save the baby from blindness .. Love you and GOD bless all of you .. U know you are doing great job.Not only Save one baby from blindness but also indirectly save one family ..